Caretaking seems to be my nemesis. Sometimes it’s joyful, as when I provided daycare (which I prefer to think of as “lovecare”) for my grandchildren while their parents were occupied with school or work. Other times it was a heavy burden, when I cared for elderly parents (I wish I could say it was also joyful, but I’d be lying: I am no saint but G-d knows I wish I was. I came to discover I’m Just. Not. That. Person. I tried, I really tried, but in the end, I failed the test). That feeling of failure in myself was so overwhelming, so devastating, so depressing and guilt-provoking that I felt incapable of caring for anything or anyone, myself included, for a long time. My children were shocked, surprised, hurt, indignant: Whaddya mean, no more babysitting? Whaddya mean, you’re moving to Maine, of all places? It’s true: I ran away. . . from my loved ones, from my grief and guilt over my mother’s and mother-in-law’s deaths, and I ran away from my own self-disappointment. I was never suicidal, but I sure as heck did not want to go on living like this, shrouded in sorrow, in the fog of confusion. I’m not ashamed to admit that I was a hairbreadth away from a nervous breakdown. My health was shot. I gained 20 lbs (which have yet to come off, three years later). The world was moving too fast for me and I couldn’t keep pace anymore, but the consequence was not just that I fell behind – – I was utterly lost. Life in Maine is slow. No one is in a hurry to get anywhere. No one runs late, because there is no such thing as overscheduling: there simply isn’t that much to do. That’s not to say that people are lazy – – they work extremely hard, physically speaking. But all the routine stressors of city life – – carpools, traffic, etc) simply don’t exist. Sometimes the slow pace can be maddening: if I am behind a car going a few miles below the speed limit; or waiting in a line while the clerk chats with the customer ahead of you; or waiting for a slow talker to finish a sentence (and having to bite my tongue lest I interrupt and finish it for him). And then I realize that seen through their eyes, my driving is aggressive and my demeanor impatient or rude and I just need to slow down. It’s harder than it sounds. I have adapted to slow living (and have, in fact, adopted it), and slowly, my nurturing side is reappearing. I think all humans need to give and get love, but sometimes we just aren’t very good at it. I knew it wasn’t healthy for me to shut out everyone except for my spouse, but I also knew I wasn’t quite ready to commit to caring for much of anything or anyone but myself. But I’ve noticed that lately, my outlook on life has greatly improved, and my short-term memory has gotten better (despite the freak-out I’ve felt when I founder, I also was able to realize that my short-term memory crashes when I’m under stress, but it’s normal otherwise). One of my baby steps in re-entering the world of caretaking was the planting of my orchard. It was really, really hard physical work digging holes in rocky earth, shlepping buckets of water (I don’t have an irrigation system), cutting hardware cloth (metal mesh) with metal snippers and then encircling each tree with wire to prevent rodent damage to the trunks, and putting in fence posts and stringing wire to keep out the deer (the latter job was just too much for me to handle and I paid a local fellow to get the job done). If I did something wrong, or even if I didn’t but the trees still failed to thrive, I would have felt bad. But at the end of the day, it’s a tree, not a person, and not the end of the world if I didn’t succeed with the orchard. The orchard won’t bear apples for another 4 – 6 years, but so far, so good – – they are thriving. I can do this! This summer I planted 6 blueberry bushes, various herbs, and I’ve just ordered some garlic to be planted in the fall. Okay, so I can take care of plants. But although they are living things that require nurturing, it’s pretty low down on the food chain, as it were. So I decided to up the ante a bit, and foster a dog. I thought that temporarily fostering a rescue dog would be a win-win situation. Spencer, our standard poodle, often mopes around the house when he is bored and I can’t provide him with the attention or stimulation he requires. He loves to play with other dogs. I’m not really in a position to own two dogs. 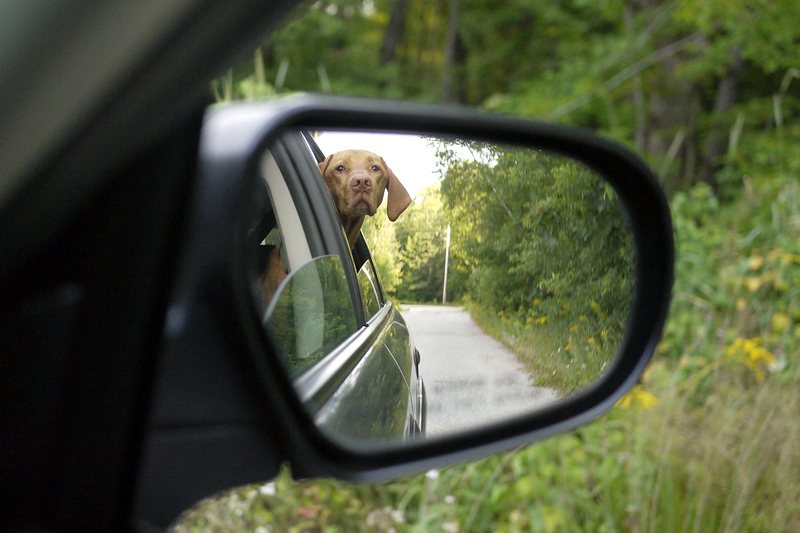 Besides the added responsibility and expense of a second dog, there is the practical matter of fitting two dogs in our car for the 11-hour ride between our hometown and Maine, a drive we do with some frequency. But fostering a dog was temporary: I could and would give it back. Most rescue organizations reimburse you for the cost of keeping a foster dog, including food, medical care, and grooming. So what are the downsides? As a result of their upbringing or relinquishment, dogs may be traumatized and have physical or behavior problems. Some dogs are given up when their owner dies or becomes disabled; others when their owners lose a job, get a divorce, or become homeless. 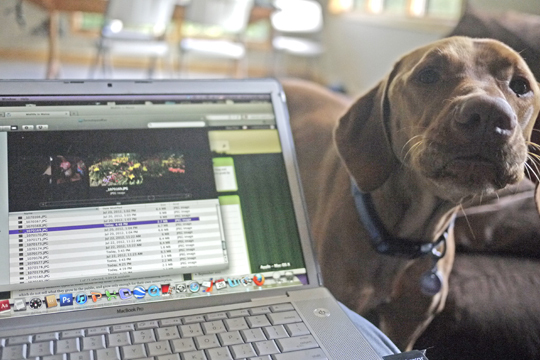 Sometimes a dog doesn’t like children or requires more exercise than the owners are wiling to provide. Anyone considering foster care has the right to reject a dog for any reason, so I thought my chances of getting a fairly normal dog would be good. 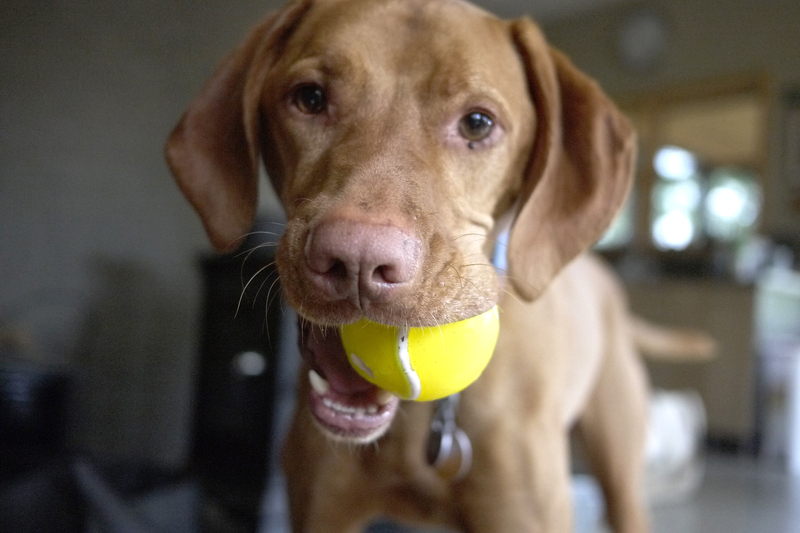 I thought it would be fun to choose a breed different from a standard poodle, so I decided to choose a viszla, which is a dog originally from Hungary that was used for hunting. It’s a highly energetic dog with very short red fur. 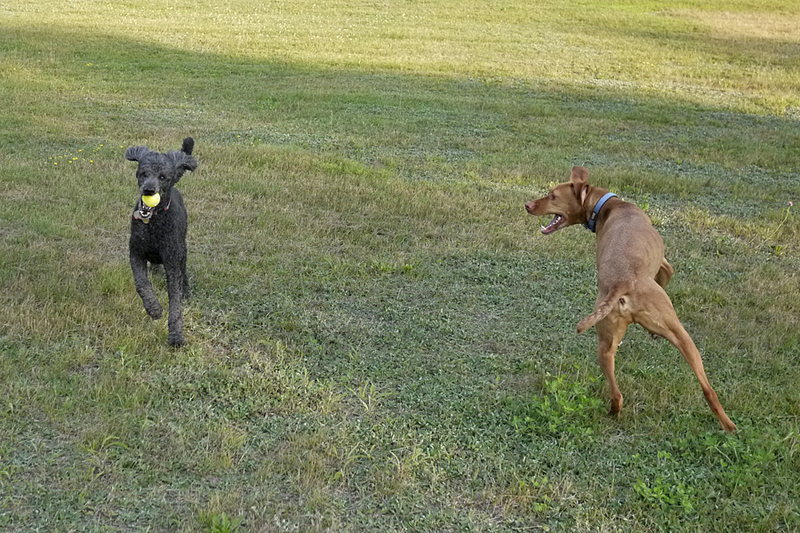 From what I could tell from some random encounters with viszlas at the dog park, its personality was similar to a standard poodle but without the extensive grooming requirements. 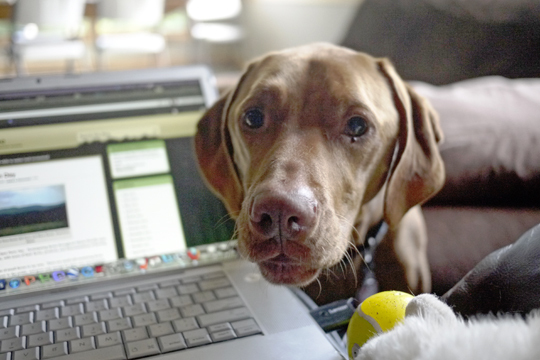 To find a viszla rescue organization in my area, I simply did a google search for “viszla rescue new england.” I filled out an application with some references, and soon got a call about a 6-year-old viszla named Willy. Willy’s main problem, I was told, was that he suffered from severe separation anxiety and a fear of thunder. If he was left alone in the house, he would sometimes – – but not always – – become destructive. The last time his family had been out, there had been a thunderstorm, and he had partially eaten and destroyed three couches! Now that their children were older, the family found themselves home less and less, and Willy’s behavior was getting worse and worse. Soon they were relegated to locking him in the basement, and as he spent more and more time alone in the basement, his behavior was getting more and more neurotic; recently he had occasionally regressed with his housebreaking, too. The owners loved Willy and assured the rescue organization that he had never ever exhibited any aggressive behavior, but that they could no longer handle his shenanigans and their “out and about” lifestyle was not going to change anytime soon. Hence they made the difficult decision to relinquish him. So on a lovely sunny summer Sunday, the head of the rescue organization drove Willy up to Maine (he had been living in a wealthy Massachusetts neighborhood) and he was transferred to me. He came with a bed, lots of toys, food, and . . . Prozac and Xanax. The Xanax was used to treat Willy’s anxiety during thunderstorms and given only occasionally, but Willy was on a whopping daily dose of 30 mg of Prozac for his separation anxiety and to calm him down. Yikes! What was I getting myself into? I didn’t think Willy’s separation anxiety would be much of a problem, because at least one of us – my husband or myself – – is always home. Willy would not have many opportunities to be destructive; and in any case the furniture in my Maine house is all vintage Craigslist and from yard sales and dumpster diving. Since Willy loved car rides, I’d take him on small errands to the post office or to fill the car with gas so he could experience adventure. It soon became apparent that Willy was not neurotic, but he did have two very strong inherent needs: he needed to be with people, and he required extensive daily exercise and playtime. 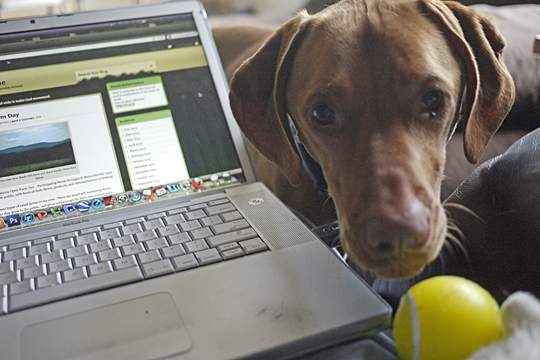 If he wanted to play while I was working on my computer, he would bring me his ball and then rest his snout on the keyboard. If I said, “Go away!” or “Not now!” Willy would step away from the computer and stand there, staring at me and looking especially sad and pitiful, waiting patiently until I’d relent. Willy was masterful at giving guilt trips. Willy could be quite persistent. If I tried to ignore him, he made funny faces to get my attention. He loved to go exploring and sniffing around, and fortunately, he had excellent recall (he would come back immediately when I’d call his name). So the first thing I did was let him go off leash, since there was no fear of traffic, but with my voice I directed him and set boundaries as to where he could and couldn’t go. Although I enjoy walking, I am not into jogging, but it was clear that Willy required a faster pace than I could provide for him. So every morning and again at dusk, I would ride my bike at full speed to the old ski resort up the road, taking a looping trail and finally doubling back to my house. Willy ran like the wind, easily 15 mph! He could have gone further but 2 miles was as much as I cared to do at 7 a.m. and at the end of a long day on a daily basis, especially when I knew that I would be keeping him busy at least three more times during the day with more walks or hikes. 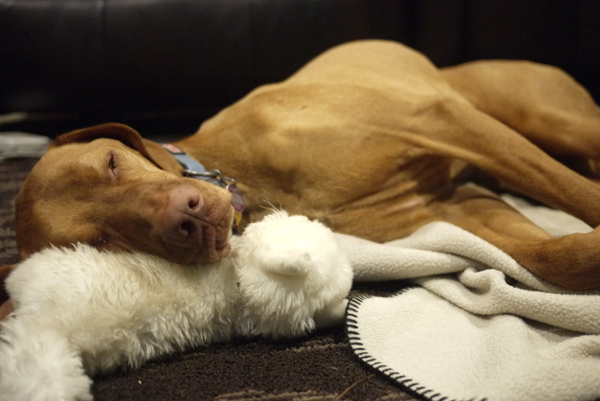 In Willy’s case, a happy dog was a tired dog. He did enjoy his naps! He also loved playing with our dog, Spencer. Willy also loved food, and our kitchen garbage can became a sore temptation for him (I solved this problem by sprinkling Tabasco sauce on the top of the trash). I was sending daily reports about Willy to the rescue organization, and told them that I thought that since Willy had not exhibited any neurosis – he was a gentle, loving dog, and provided his needs for companionship and exercise could be met, he would make a new owner very happy – – I wondered if he could stop taking his meds. After consulting with a vet, the rescue organization representative told me that he could not go off Prozac cold turkey, but that I’d have to wean him off the medication. So the first week he went from 30 mg. to 20 mg., the second week from 20 mg. to 10 mg., and the third week from 10 mg. to 5 mg. He was doing great. The first time there was a thunderstorm, Willy expressed alarm at the initial sound of a thunder-clap, so I went over to him (he was on his dog bed) and pet him and said gently, “It’s okay.” He immediately calmed down and went straight to sleep. So much for his thunder phobia. There were two things I really hated about Willy, and neither thing was his fault: he was a copious shedder, and I detested the constant sweeping and vacuuming; and even worse, I found out, much to my surprise, that I was allergic to him! I have always had non-shedding dogs, so I wasn’t prepared to deal with my watery, itchy eyes, my constantly running nose, and my closed-up throat which was always sore when he was around. I contacted the rescue organization and suggested that they might want to find a permanent home for him sooner than later, because my mind was in a constant fog from taking antihistamines. The rescue organization representative assured me that they had three solid candidates who wanted to adopt Willy, but that she would have to do home visits to make sure that they looked as good in person as they sounded on their applications. I met the rescue representative about an hour from my house, and somewhat wistfully I transferred Willy and his bed, leash, food and toys from my car to hers. She would be driving Willy to the ferry where he would continue to Nantucket Island to start his new doggy life. The new family would have to wean him off his final 5 mg of Prozac, but I didn’t anticipate any problems. The rescue representative assured me she would send me email updates and let me know how Willy was doing. He really was a great dog, and even my husband (a reluctant dog owner at best) was a bit sorry to see him go. Spencer, however, did not seem sorry at all. In fact he was relieved, I think, to see Willy go. Besides Spencer’s dismay at having to share my personal attention with another dog, he was just plumb tired out from Willy’s constant need to play, play, play and run, run, run. I felt terrible. In the three short weeks that Willy had been under my care, he had done great. And now this – back on drugs and homeless! I felt so guilty! And I felt so bad for Willy, a victim of circumstances that were no fault of his own. One thing I was sure of: Willy could not afford to be tossed from home to home. He needed a feeling of stability and security and love to be the great, fun dog he was meant to be. I really, really tried not to think about Willy over the next two weeks. “WILLY” said the subject line from the rescue representative. I was afraid to open the latest email, and finally did so with great apprehension. Willy is doing wonderful. He has been off prozac for a couple of weeks and has calmed down a lot. We can leave the dogs alone for a couple of hours at the house and they seem fine. They are getting along well and Guin, our other viszla, is starting to play with Willy out on the trails and in the backyard but he has so much more energy than she has but they have fun. Willy has discovered our large fish in the tank so when we leave we make sure that the door is shut to that room. He gets excited when we get home but he calms down much faster than he did before. Guin is getting more used to him every day and sometimes they sleep together. Willy is a wonderful dog and we love him so much. To say I felt happy and relieved is an understatement. I don’t know if I could foster another dog, though. It’s rewarding when it works out, but when it doesn’t . . . even knowing you’re not keeping the dog permanently, you still develop a connection. 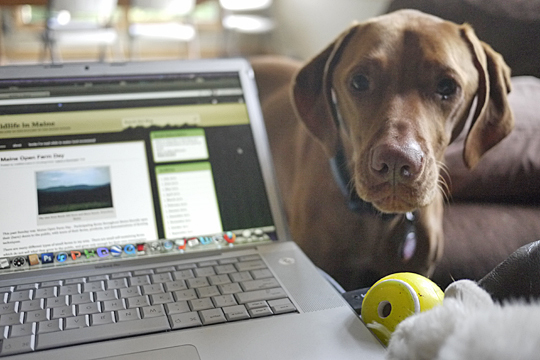 When you nurture something – – even a plant or a dog – – you’re invested. I returned to my home town a month later. Even before I got there, my children had “booked” me for babysitting while they went to PTA meetings and doctor appointments. More caretaking. More nurturing. But these weren’t plants or dogs – they were my grandchildren. Did I have the patience and the energy? More importantly, did I have enough confidence in my abilities to take on this responsibility? The first few times were very stressful for me, mostly because of my own insecurities. I forced myself to slow down, relax, and just savor the moment. I thought about how appreciative I was that I had grandchildren, and that my children had enough confidence in me to care for their children. I thanked HaShem that I had the health to be able to do this. I concentrated on the opportunity to further develop a unique relationship with my grandchildren, and through small, simple acts of love, to make enduring memories with them. I surprised myself. “I can do this,” I thought. Caretaking takes from the recepient or gives with strings attached; caregiving gives freely. Caretakers don’t practice self-care because they mistakenly believe it is a selfish act. Caregivers practice self-care unabashedly because they know that keeping themselves happy enables them to be of service to others. Caretakers worry; caregivers take action and solve problems. Caretakers think they know what’s best for others; caregivers only know what’s best for themselves. Caretakers don’t trust others’ abilities to care for themselves, caregivers trust others enough to allow them to activate their own inner guidance and problem solving capabilities. Caretakers tend to attract needy people. Caregivers tend to attract healthy people. (Hint: We tend to attract people who are slightly above or below our own level of mental health). Caretakers start fixing when a problem arises; caregivers respectfully wait to be asked to help. Caretakers use the word “You” a lot and Caregivers say “I” more. One of my goals for the coming year is to get rid of STUFF. I’m not a collector of tchotchkes but I have boxes and boxes of papers and old articles I’ve written or collected, and tens of thousands of family photos. Recently I was going through a box of photos and memorabilia that belonged to my mother (I still have some of her stuff, too). I found a note dated Dec. 1982 written to her by a family friend, who was responding to her after she must have complained to him about the onus of taking care of her mother (my grandmother). Oh, how I wish I could have read these words when I was taking care of my mother and mother-in-law and it applied to me! My New Year’s resolution is to do something about myself. I need to lose almost 60 lbs., and it’s gotten to the point where besides being extremely unhappy about my appearance, my excess weight is affecting my health and the quality of my life. I have tried a slew of different diets over the years, and I won’t bore you by listing them. But I’ve been feeling so discouraged about my failure to master this weakness that I mentioned my desperation to my endocrinologist as well as my GP, hoping they’d have some suggestions for me. Look, I know there is no magic bullet. That said, I found both responses highly unprofessional. I’m not really looking for a diet, but for a food plan that I can use for the rest of my life. I did sign up with a nutritionist who has some interesting ideas. She offered some nutritional advice that was highly personalized and appears helpful, but so far, her main thing is something called “mindful eating.” Basically it forces you to be aware of your hunger level, at what level of hunger you eat, and at what point of satiety do you stop eating. It forces you to think not only of what particular food you are eating at that moment, but why you made that particular choice. After reading a book called “Eating Mindfully” by Susan Albers, I realized that “mindful eating” has always been a tenet of Judaism (though that may not be so obvious when you see people stuffing themselves at a kiddush). If we really take the concept of blessings seriously, we are eating mindfully and spiritually. We don’t just bite into an apple; we first say a blessing praising G-d for creating the fruits of the tree. When we make “hamotzi” over challah, it makes us think of the miraculous process that went into making a simple loaf of bread. When we say blessings after the meal, we not only show appreciation and gratitude for sustenance but also recognize the centrality of G-d to our very existence. There is nothing wrong with enjoying our food, but ultimately, we should not live to eat. Rather, we should eat to live (easier said than done!). I have no idea if I will eventually triumph over my weaknesses, but even if I do not, what can I do? Try, try, and try again . . .and again. The beauty of Rosh HaShana and Yom Kippur is that our efforts to better ourselves – – if sincere – – are recognized by G-d even if we are unsuccessful. So if He is not ready to give up on us, how can we give up on ourselves? I wish everyone a year of peace, good health, sustenance, nachas and success. As we enter the New Year, well . . . let’s face it, the world is a mess and times are scary. That’s why I love this video posted on YouTube. Matt Harding is just a regular guy, and an extremely mediocre dancer. He has this crazy, unrealistic idea that people can unite through simple joy – – in this case, dance. Yeah, I know – – it’s ridiculous. But watch the video, and see if during its five-minute duration, you aren’t somewhat transformed and start believing that maybe there is hope for humanity after all. Just in time for a Happy, Sweet New Year! For the BeeMan, 2012 was a very good year, one of his best ever in recent memory. Spring came early this year to the White Mountains, with lots of sunshine, warm days, and early blossoming. But then, in June, it rained almost non-stop and BeeMan thought his honey production would suffer, since bees crave hot, dry, warm sunny days for foraging, pollinating, and raising new broods in their hives. 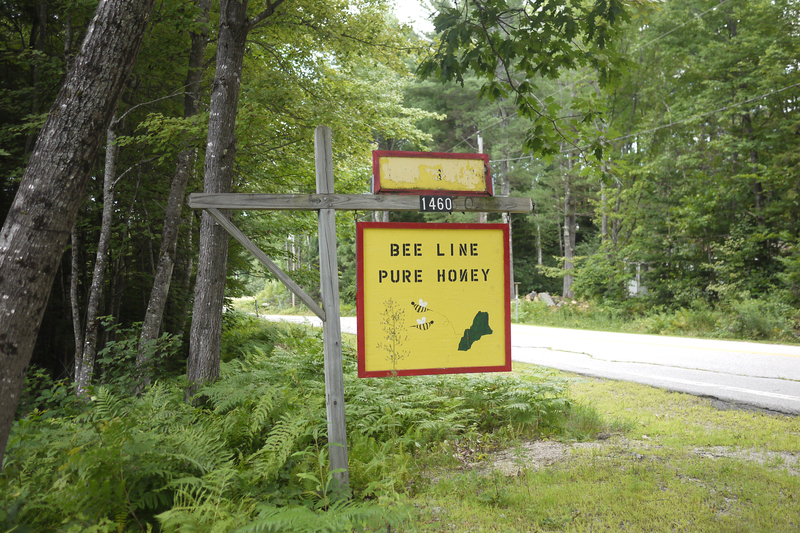 But the rain allowed for tremendous crop growth and lots of blossoms for the bees to pollinate – it was one of the best growing seasons ever in Maine – and then came the record-setting heat wave in July, and things once again started looking up. BeeMan took a week’s vacation from his regular job at Lowe’s, but harvesting the honey from his 35 hives located on his land and on other people’s property (mine included) up to 15 miles away was no vacation. 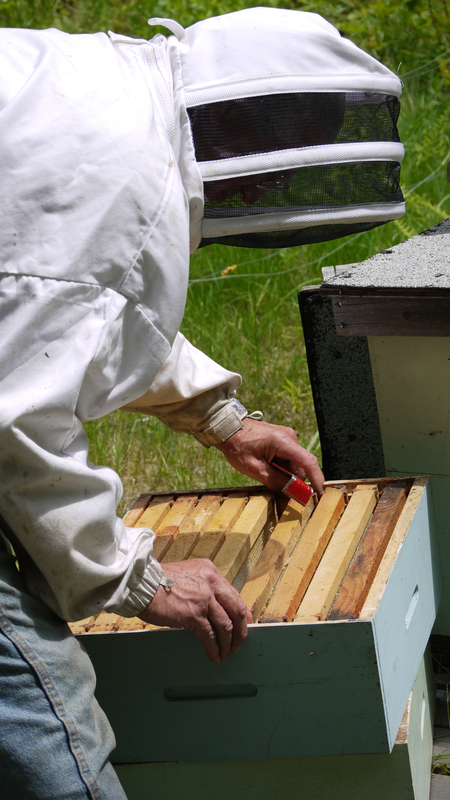 He started at 7 a.m. every morning by driving his truck to the sites of his hives. 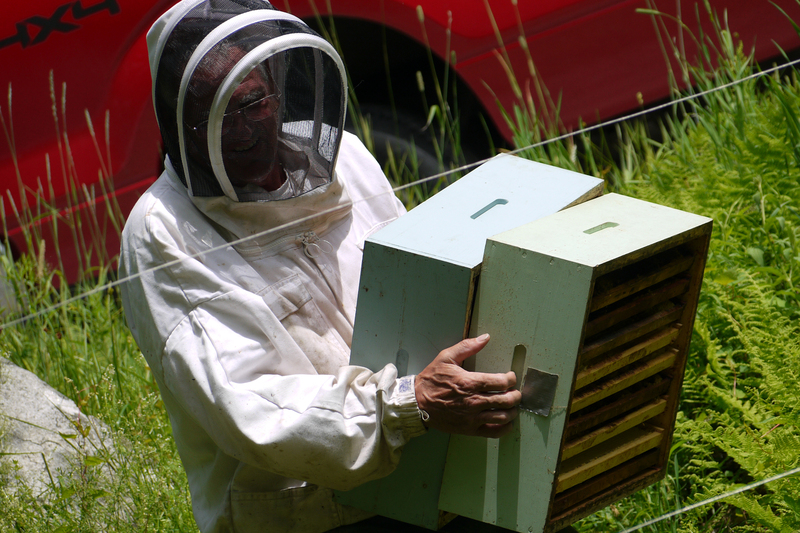 Wearing his bee jacket to avoid stings and toting his smoker to calm the bees, he opened the hives and removed most of the “supers,” the boxes containing frames of honeycomb filled with honey. Dried leaves or grass are put into the smoker, and then lit. 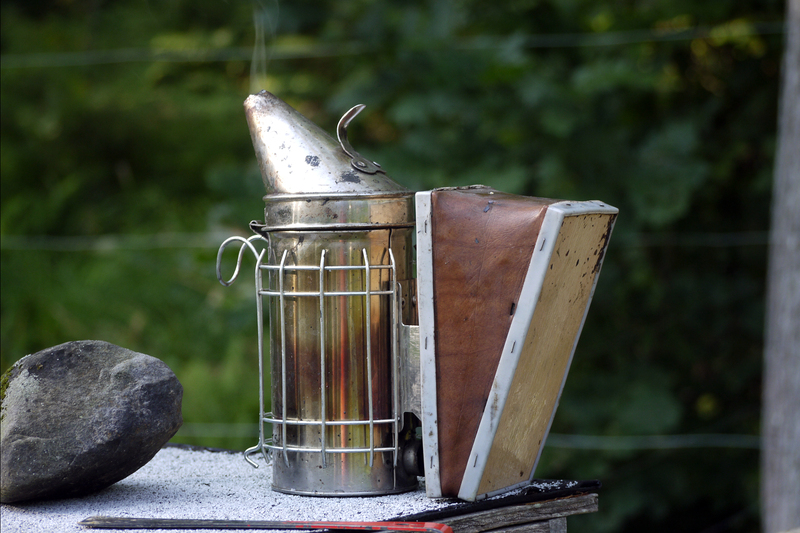 The smoke calms the bees when their hives must be tended, reducing the likelihood of getting stung. You can see the smoke coming out of the top of the cone. 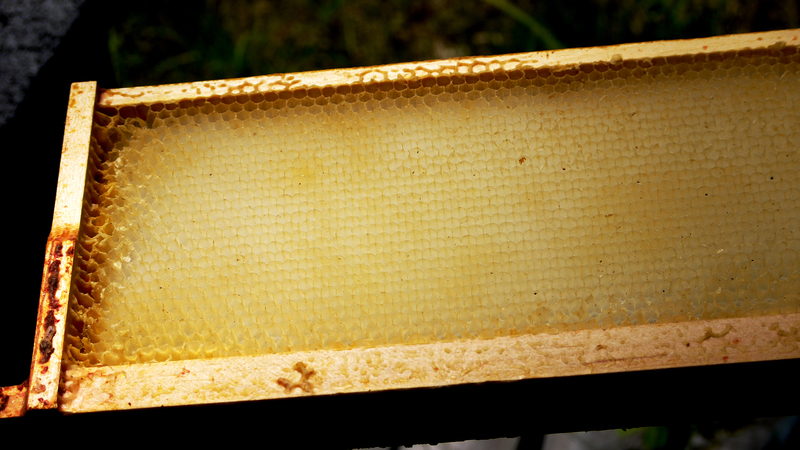 Each frame holds a sheet of honeycomb, from which the honey is extracted. This is a close-up of a frame. You can see the remains of the honeycomb. The honey has already been extracted from this frame. Each stacked wooden box weighed up to 50 lbs – a job that entails a lot of heavy lifting for a man well into his seventies and plagued with arthritis. And each box had to be lifted a minimum of three times: once from the hive, lugged tens of feet if the area where the hives were located was not vehicle-accessible, lifted onto his truck, and then shlepped from his truck to his Honey House where BeeMan would begin the honey extraction process. This picture is of the BeeMan shlepping empty supers to the hive. 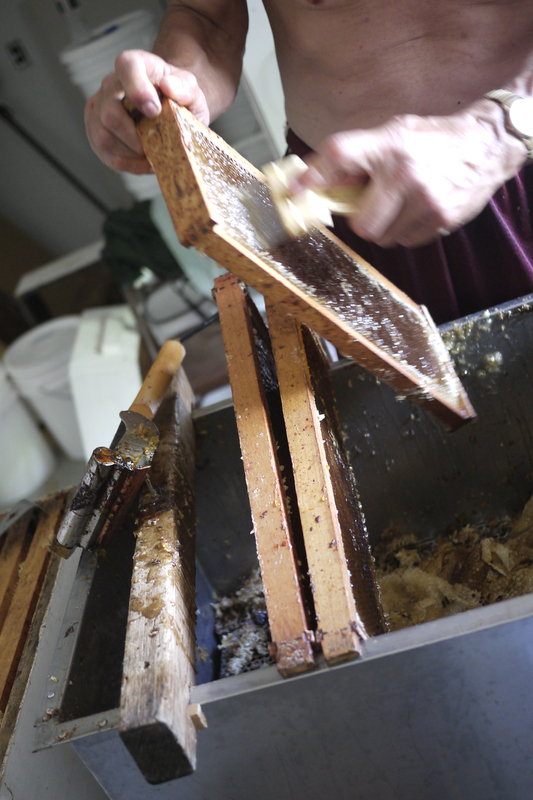 But when they are full of honey, typically each box weighs 30 – 50 lbs. 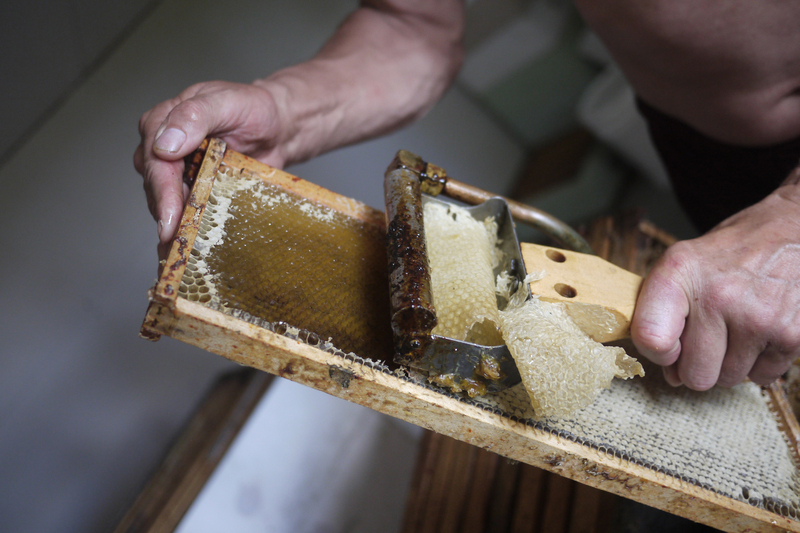 After scraping the honeycomb from the supers, he puts the sticky, honey-filled combs into an electric extractor, which extracts the honey from the combs with centrifugal force. From there the honey is put through two filters, to remove the occasional dead bee, or bee body parts like a stray wing or leg, from the honey. BeeMan does not pasteurize his honey, since heating reduces the nutritional value of honey, so his honey is considered “raw filtered.” Unfiltered honey, due to the unwanted bee parts, cannot be considered kosher, since we are not allowed to consume insects, intentionally or otherwise. Here’s what honeycomb looks like fresh out of the super, still in its frame. 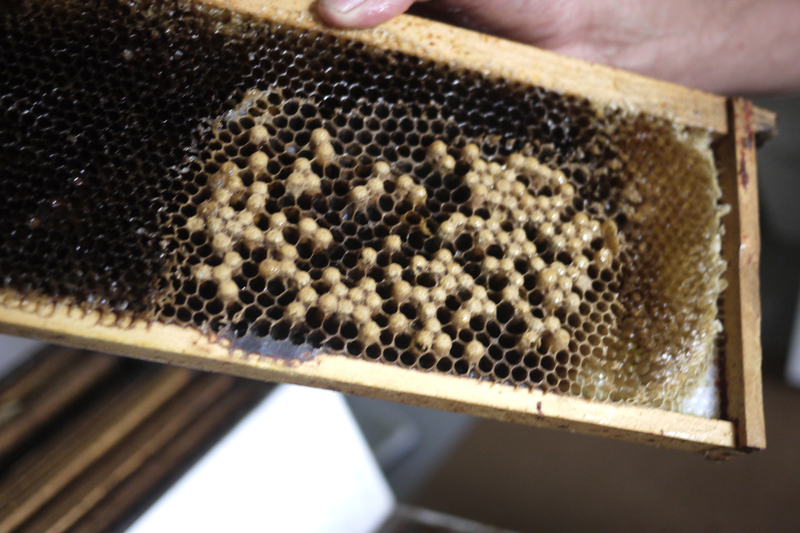 Here are a stack of honeycomb-filled frames taken from the super. They are placed over a stainless steel trough. 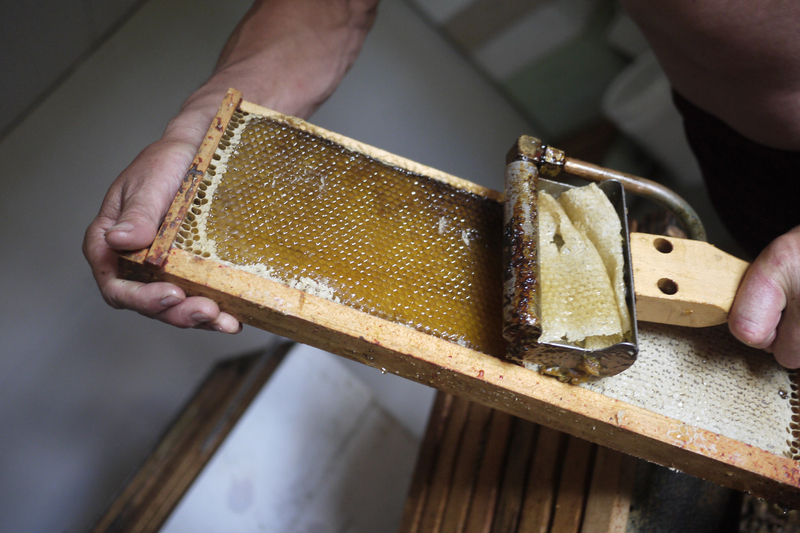 The honeycombs are roughly abraded with the tool, to help release the honey from the sealed combs. Next a propane-heated scraper tool softens the honeycomb and peels it off the frame. The honeycomb drops into the trough. Because the room temperature of the Honey House is sweltering, the honey drips and drains through the holes in the trough where it collects in a bucket below. 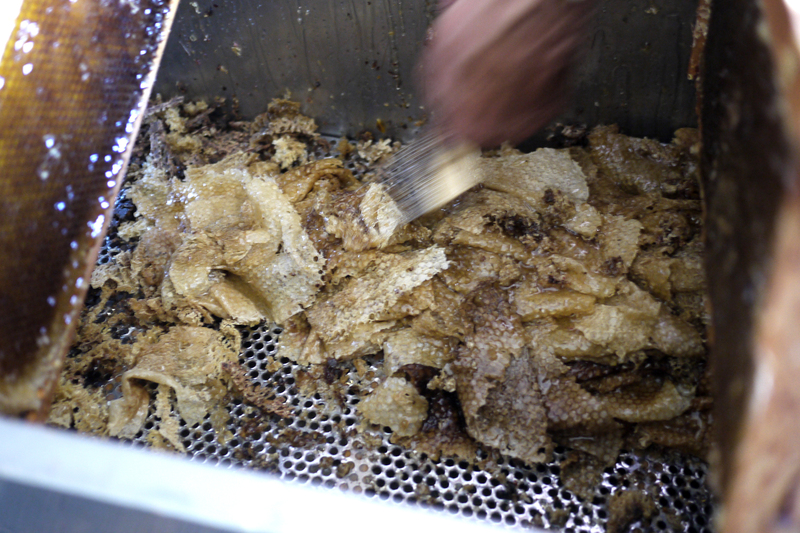 The waxy honeycomb itself is saved and used for bee feed, as well as made into hand cream. It can also be made into candles. Next the honeycomb is dumped into this electric extractor, which has a powerful motor. Centrifugal force further separates the honey from the honeycomb. The honey drips into a bucket below, where it is double filtered to ensure no stray bee parts such as wings or legs get into the honey. 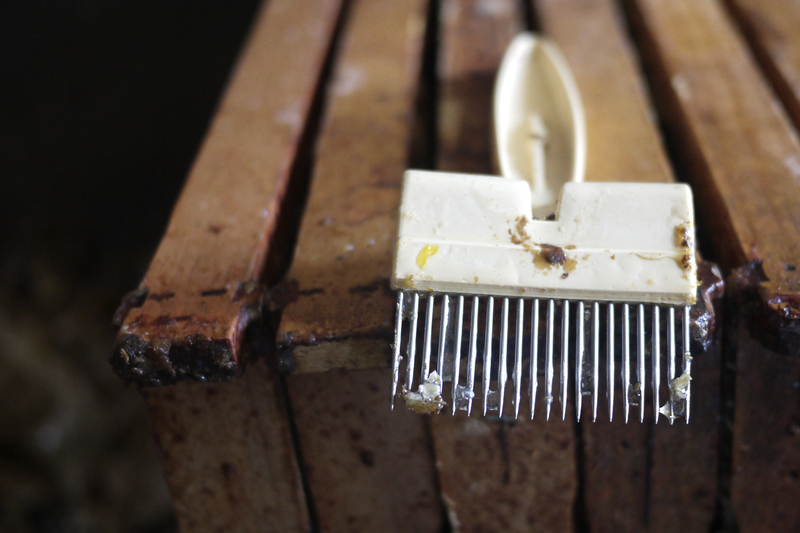 The wax from the honeycomb is saved and used as bee feed, or as a hand cream ingredient. It can also be used to make candles. 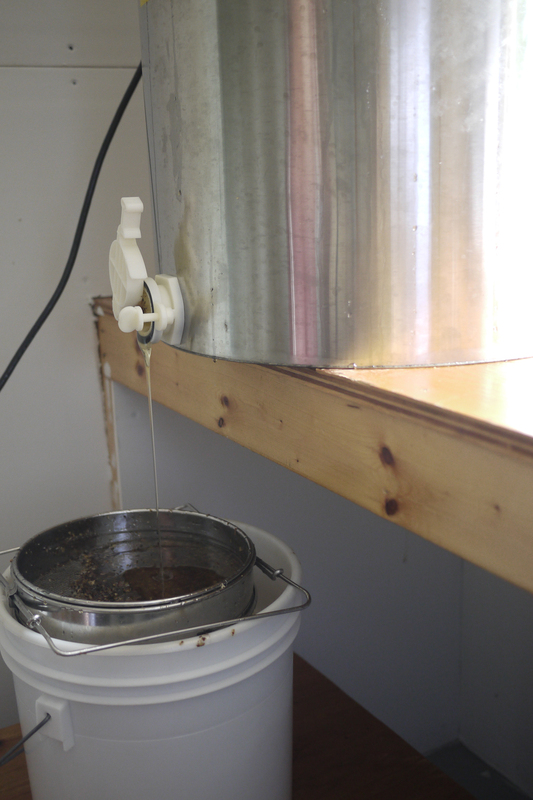 Honey drips into a filtered bucket. 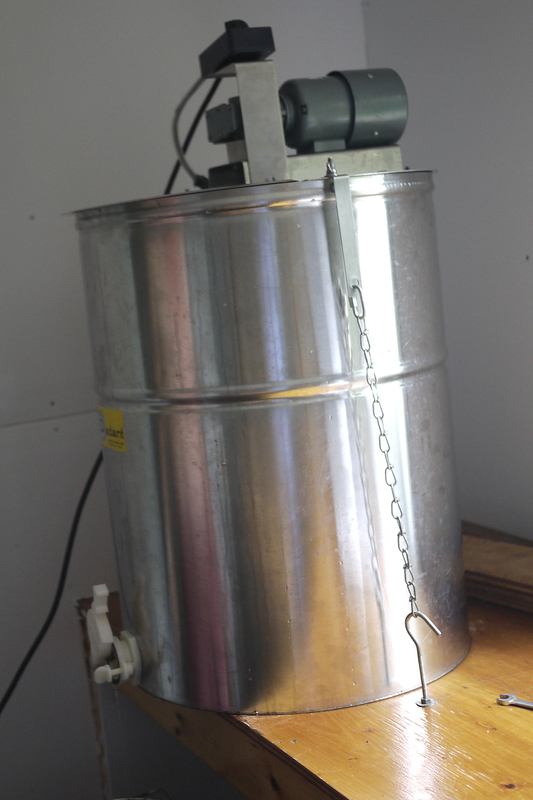 Non-electric hand-cranked honey extractors are much cheaper and may be used by small-scale honey producers, but they take much more time and physical effort. Honey’s viscosity is determined by temperature. The warmer the temperature, the thinner the honey and better flow. In order for the honey to be able to pass easily through the filters, it must be “thin.” So the Honey House where the extraction and filtering takes place is sweltering! It was at least 100 degrees inside when I went to learn about and photograph the extraction process. BeeMan spends about 8 hours non-stop doing honey extraction, and loses about 5 lbs a day in water weight. Call it the “Honey Diet” but I don’t recommend it! By the time he retires for the night, he’s put in a 12- to 13-hour day, and he does this for an entire week. 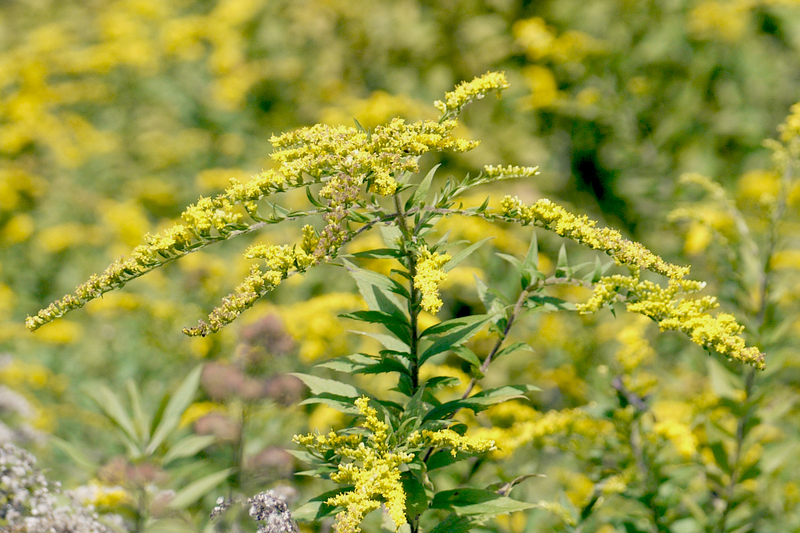 Honey made from goldenrod is especially prized by apiarists. 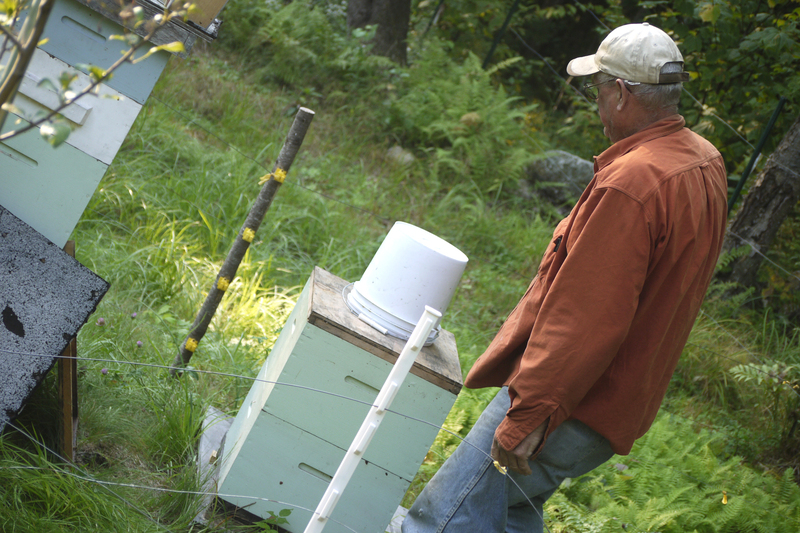 The taste of the honey is determined by what the bees forage on – – apple or blueberry blossoms, goldenrod, clover, or wildflowers here in the White Mountains. Bees usually forage about 2 miles from the hive, but they can travel as far as a 5-mile radius in search of pollen. It takes them 5 – 8 minutes, traveling 30 – 40 mph, to reach their destination. Since beekeepers cannot control where the bees forage, it is difficult to call any honey “organic.” Although I do not use pesticides, bees from the hives on my property could theoretically pollinate someone’s plants from their garden or farm where pesticides are used if they live within 5 miles of my home. 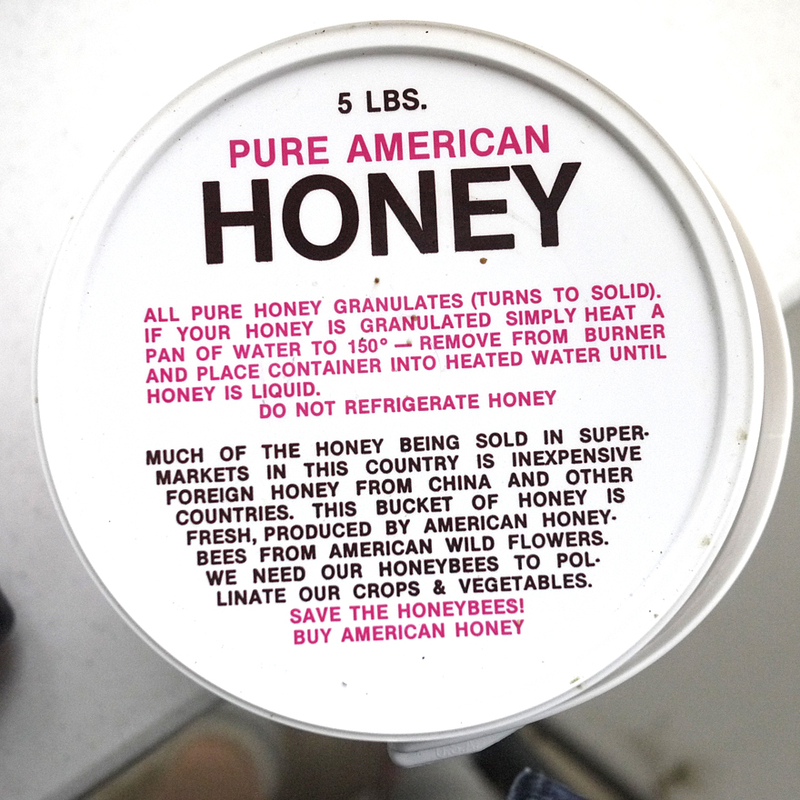 So if you see any honey labeled “organic,” you should react with skepticism. 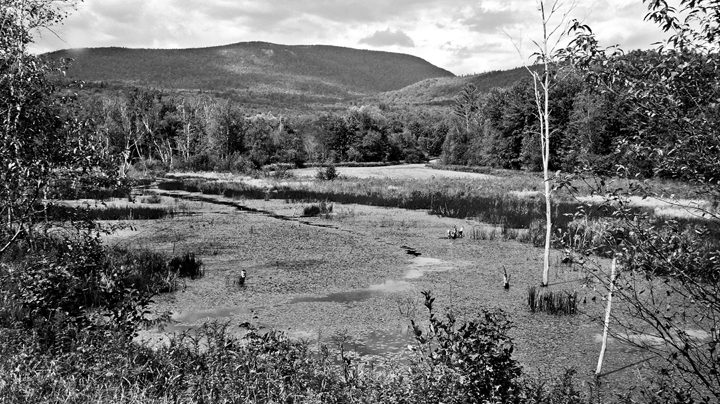 Of his 35 hives spread over the White Mountains on both the New Hampshire and Maine sides, bees from the hives on my property were “babies” and didn’t really produce enough honey to warrant extraction, but BeeMan said that by next year the colony should be built up enough to be a strong producer. For next year, he wants to cut down 3 trees (oak, beech and birch) which produced too much shade over the hives (I gave BeeMan the okay to do so); bees are less active in shade. To strengthen the smallest of my three hives so that it might better survive the winter, BeeMan left a “feed bucket” of honey-encrusted beeswax shavings that he extracted from other hives during his honey harvesting week, which he placed over the top of the hive. It will take about 2 weeks for the bees to consume the feed, after which BeeMan will be back to replace the regular, sturdier top to the hive. A feed bucket rests on a hole at the top of the hive. 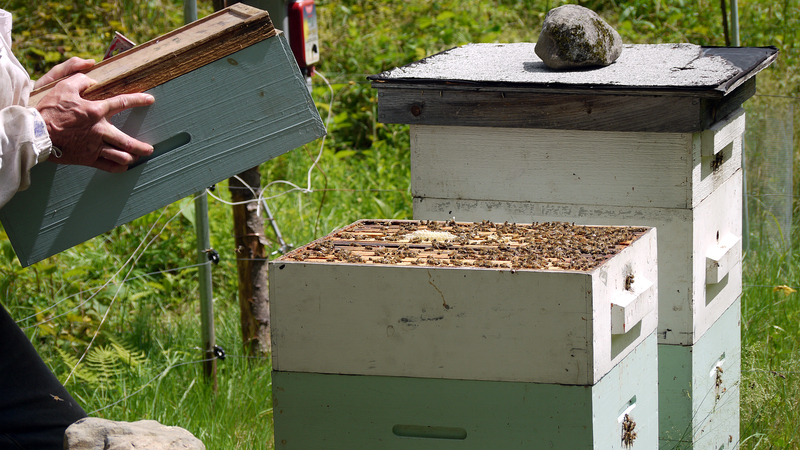 This will give young bees a nutritional boost to help them survive the winter ahead. Three of his hives on another person’s property were molested by a bear – – one hive was completely destroyed and two were damaged, but he was still able to extract a reduced amount of honey from those two hives after he shot and killed the bear. Skunks and raccoons can also molest and damage hives (he catches these critters in live traps and removes them to other areas). 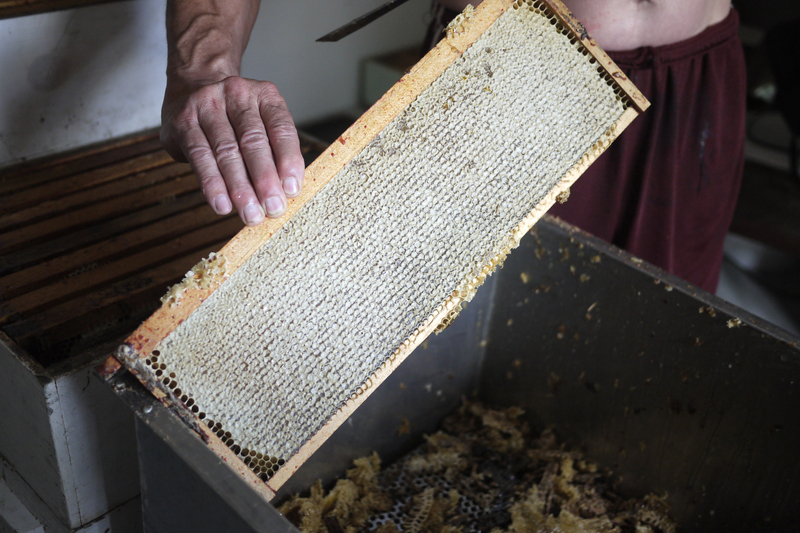 In the end, he was able to harvest 1700 pounds of honey, or approximately 55 lbs of honey per hive! (The yield is more typically 30 – 40 lbs per hive.) BeeMan sells his honey for $6 per pound or $23 for 5 lbs, so it’s a nice source of extra income for him. He also uses the beeswax for a hand cream that he makes and sells. (He also grows all his own vegetables and keeps chickens for eggs and meat and is pretty much self-sufficient). And that’s if things go right. A very hard winter can kill off a bee colony. I’m not sure I’m ready to contend with trapping or killing bears, skunks and raccoons or the damage they can do with the resulting losses. Disease and colony collapse might also strike. I spoke to one unfortunate beekeeper who lives 30 miles away. Last year he had an amazing and profitable harvest from 30 hives, so he set up an additional 50 hives for a total of 80 hives. He imported good bee stock and queens from California. Things started out okay, but when he checked at the beginning of summer, the hives weren’t producing so well and there weren’t as many bees as he had hoped. When he returned 3 weeks later, almost all his bees were dead, victims of Colony Collapse Syndrome, a condition affecting bees worldwide but whose cause is unknown (although recent evidence points to pesticides as a possible villain). 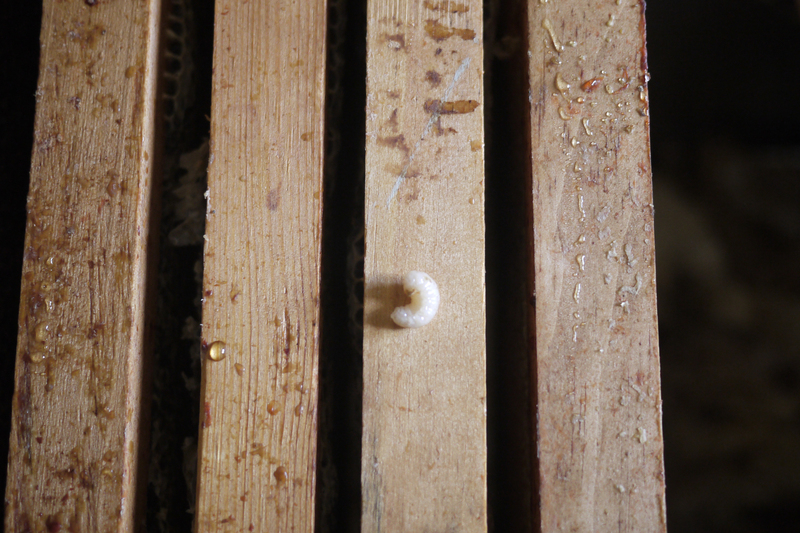 He is now down to only 3 hives, and is too discouraged (and broke) to start over again. Beekeeping, like most farming, agronomy, and the raising of livestock, takes knowledge, physical strength, courage and prayer. Getting up close and personal to the growing process has given me a new-found respect and appreciation for farmers and faith, for the miracles of G-d’s creations and orderliness and chaos of His world, and the realization that the sometimes-high prices of local small farm products are not the result of greed, but compensation for the blood, sweat and tears involved in making an honest living, providing us with quality food on our table, so that we may live. It really did feel like the last day of summer today. The nights are cool (in the 40s) but the days are still warm. We are rapidly losing daylight, and some maple trees are already starting to change color. HaShem is taking care of creatures large and small. Now that the wild raspberries and blueberries are gone, beechnuts fall hard to the ground, providing a late bounty and last chance for squirrels and chipmunks to hoard, and for bears to fill their stomachs before they go into hibernation. Today my husband climbed Speckled Mountain with our friend Peter, Speckled Mountain is the tallest mountain of the White Mountains on the Maine side of the border. They climbed up one side to the summit, and then went over and all the way down the other side, where I picked them up with my car. This is not an easy climb, especially for someone gettin’ up there in years! I am so proud of him for completing this challenging hike. While he was gone I walked up the road to Evergreen Valley. 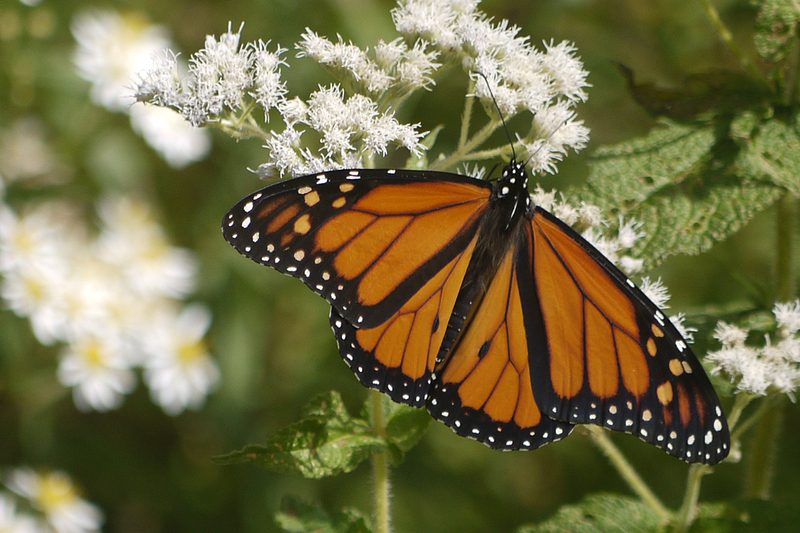 The butterflies and bees were going crazy foraging, pollinating the goldenrod and other beautiful late summer wildflowers. 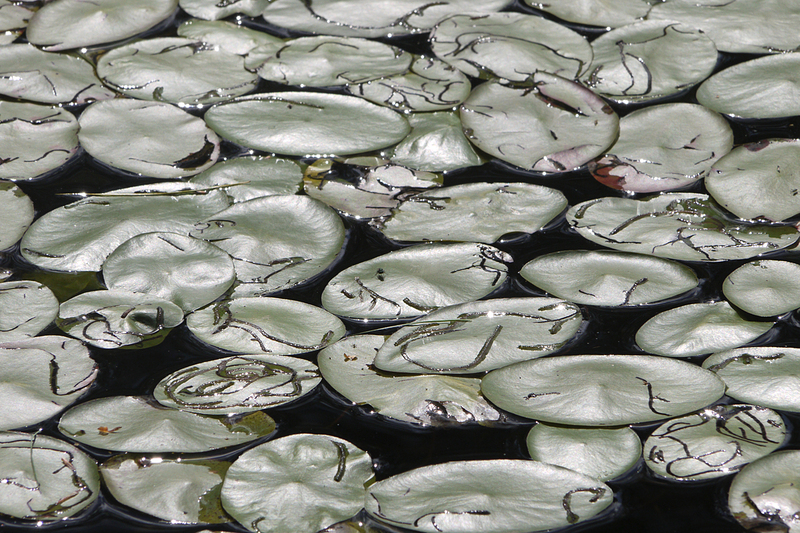 The lilypads in the pond were done blooming, but the irridescent sheen of the pads on the water was dream-like. It was an amazing day.